Can earthworms be used as bio-indicators of land-use perturbations in semi-deciduous forest? The potential of tropical earthworms as bio-indicators of forest degradation by human-induced activities was assessed at a landscape level in the Ivory Coast. The study site covered 400 ha and was characterized by a set of land-use types along a gradient of perturbation from semi-deciduous forest, through reforestation, fallow systems to cultivated annual crops. Samples were taken on a grid at each sampling point and earthworms were hand-sorted from a 25 × 25 × 30-cm soil monolith. Results showed a potential increase in relative populations (number: +53.1%, biomass: +94.8%) of species in the earthworm communities following forest conversion. Furthermore, the impact of land-use change was higher in relation to land-use intensification in terms of earthworm populations and diversity in intermediate-disturbed systems (Multispecies plantations, old fallows). 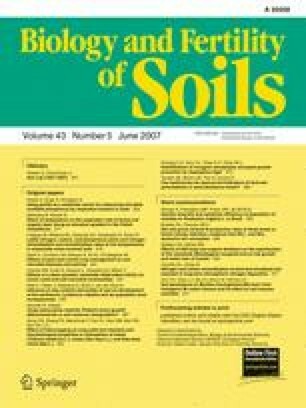 Earthworm diversity was the most sensitive response to land-use change. The species Dichogaster saliens Beddard 1893, Hyperiodrilus africanus Beddard 1891, Millsonia omodeoi Sims 1986, Dichogaster baeri Sciacchitano 1952, Dichogaster ehrhardti Michaelsen 1898, Agastrodrilus sp., Stuhlmannia palustris Omodeo and Vaillaud 1967 and, to some extent, Millsonia sp. appeared to be most sensitive to land-use change. More field and laboratory investigations are needed to find out the most efficient species to be used in bio-monitoring programmes aimed at preventing ecosystem degradation due to anthropogenic activities in the forest areas of Ivory Coast. This study was funded by GEF-UNEP, as part of the project No. GF/2715-2 entitled ‘Conservation and Sustainable Management of Below-Ground Biodiversity’. The authors would like to thank the staff of the Executive Agency TSBF Institute of CIAT for their coordination. They are also grateful to the farmers from the village Goulikao and the National Forestry Agency (SODEFOR) for facilitating access to the field site. Dr. Pascal Angui and two anonymous referees are congratulated for their comments and suggestions on improving the text.